In a video that has gone viral on Facebook, the British diva asked "Would anyone come to my show if I went to Manila?" And just like that, Filipinos from all walks of life answered with lots of "Yes", "Definitely," and "Please make it happen" on the page of Philippine Concerts which posted the video on the social network. 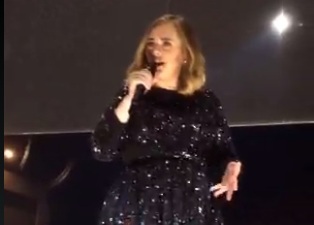 Adele posed the question to a group of Filipinos who caught her attention during her concert in Antwerp, Belgium, a video of which was uploaded on Michel Keppens' RecPeriscope account. She was going around the stage, connecting with her audience and asking "Where you from?" when a Filipino group shouted, "Philippines!" 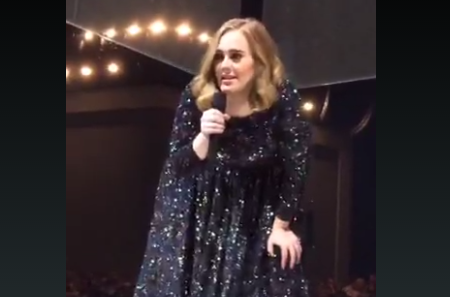 Someone from the group answered Manila, when Adele asked where exactly they're from. She then told a story about her friend going on a tour two years ago, details of which were sadly inaudible because of the background noise. At any rate, when she finished her story and was about to talk with other groups in the audience, that's when she popped the question about coming to Manila. Would anyone come to see her show in Manila? A male voice from the Filipino group can be heard shouting, "Of course, of course! You're a legend!" Most Filipinos will agree with that description, and will probably add goddess, diva, queen, and a lot more superlatives to the list. Filipinos love Adele and she's almost everybody's favorite diva. We are suckers for singers who can scale those ultra high notes, and that happens to be one of Adele's trademarks. Adele is undoubtedly at the top of almost every Filipino's wish list of performers to watch live in concert. Adele's Filipino fans are now holding on to that spontaneous question, hoping that she's hinting of a Philippine concert anytime in the future. The year 2016 is definitely not possible for a Manila concert, though, IF ever that would happen. The diva's third concert tour titled "Adele Live 2016", with a total of 105 shows, are concentrated in Europe and North America. It began last Feb 29 and will have its last show in Mexico City, Mexico on November 15. After her tour, Adele is expected to rest and take care of her three-year-old son Angelo. There was a rumor that circulated in March of this year which said that Adele told her closest friends she will take a five-year hiatus before bringing out an album. She also does not want to miss out on her son growing up. Though Adele has not confirmed nor denied the rumor, which supposedly a source close to Adele revealed to The Sun, that would be sad news for every Adele fan, Filipinos included. If the rumor turns out to be true, then Adele's concert in the Philippines would be slated in 2021. Will Filipinos wait that long for Adele? Well, consider this. Filipinos have waited for a Madonna concert since 1984, when her single "Like A Virgin" became a worldwide hit and reached Philippine shores. It was thirty-two years later, in February of this year, when she finally held a two-day concert for the Manila stop of her Rebel Heart tour. And yet, her fans still paid the priciest concert tickets in the Philippines, with Super VIP burning pockets at P57,750 or roughly $1250.00. So, yes of course, Filipinos will definitely wait for Adele. Whatever price her concert tickets will go for, expect her fans to grab it at any price. We can just picture Filipinos saying, "Hello? We're talking about Adele here!"